Twenty years ago, some local sailors established the Saginaw Bay Community Sailing Association to provide affordable sailing lessons in the Saginaw Bay Michigan area. Starting out with a few donated Optimist prams, the program quickly grew and additional boats were needed. Gougeon Brothers Inc. provided the SBCSA with floor space in the loft of the GBI Boat Shop and the SBCSA winter boat building sessions began building 5 more prams for the school. That was about 14 years ago. After that first successful winter of boat building the idea to form a winter boat building class came to light. 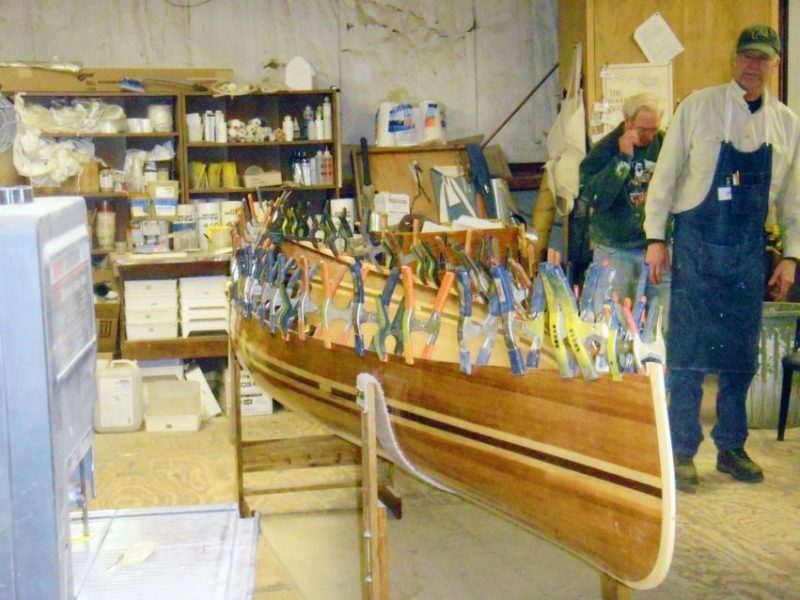 The boat building class would meet twice a week for about four months to teach boat building and epoxy techniques and produce a boat that was then raffled as a fund raiser for the SBCSA. 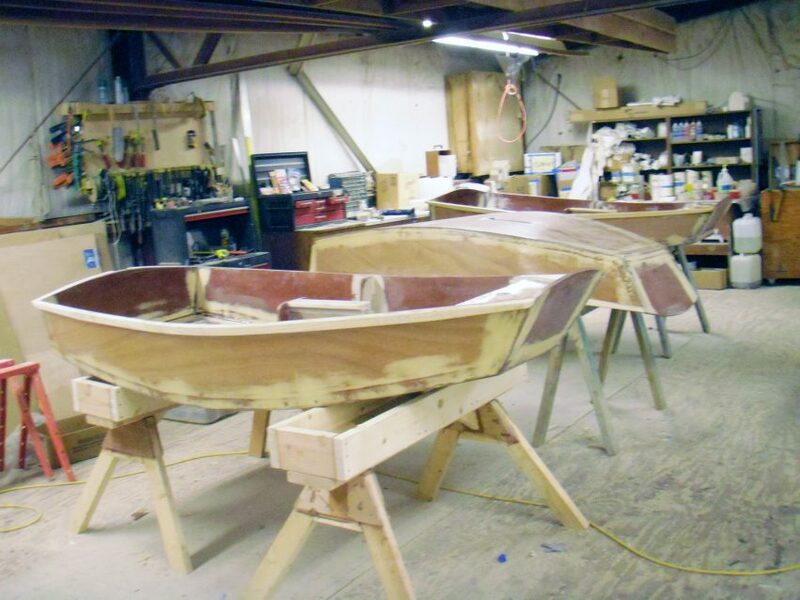 During those first 13 years the class has produced five Optimist Prams, two Newfound Boatworks Rangeley rowing skiffs, three Joel White Shellback Dinghies, two Brooks Boat Designs 12′ “Ellen” sailing skiffs, one 13′ EddyCat, one Bear Mountain Boats 15′ “Bob’s Special” cedar strip canoe (top), and one 22′ Zurn EL electric motor launch. The class is structured so that there is a boat partially completed from the previous year and another boat to be started. That way a new student will be able to see boats in two different stages and can choose which stage to work on. Usually a boat is finished every year but as projects go that is not always the case. The Zurn EL was planned as a three year project and the EddyCat, which was a reproduction of a 1946 local boat, took longer than expected because the first year was spent lofting the plans. The SBCSA boat building class is limited to 20 students and there are six volunteer instructors. The class meets every Monday and Wednesday from 6:00 P.M. until 9:00 P.M from the first week in January until the middle of April at the GBI boat shop. The student body consists of about 10 students that return every year with 10 new students that usually attend for more than one year. The cost is a SBCSA membership and a small materials fee. For the 2014 session three new Optimist prams were completed. Two Chesapeake Light Craft hybrid kayaks were also started; these will be raffled as a pair in 2016. Also two pairs of “Sam Manning” saw horses and a new flight of stairs for the boat shop were built. The 8′ Optimist Prams were started in 2013 and completed in 2014, they were built to replace three of the aging fiberglass prams. The new prams were made of 4- and 6-mil marine plywood covered inside and out with 6 oz. glass. Gunwales, mast partners, thwarts, dagger boards and rudders were fabricated and installed. After several coats of paint they are ready for the 2014 season. The new project for 2014 was the starting of two Chesapeake Light Craft Wood Duck 12 kayaks. These are hybrid craft, stitch and glue hulls with cedar strip decks. The boats were made from plans with all parts being cut out concurrently. The hulls were stitched and glassed and the deck laid up on the first boat. Both kayaks will be completed in time for the 2016 raffle. Final touches were done on the Zurn EL, trim, interior, electronics and propulsion all done in time for a June 7th, 2014 launch. More information on the Saginaw Bay Community Sailing Association sailing programs and the winter boat building classes can be found on the website www.sbcsa.org. 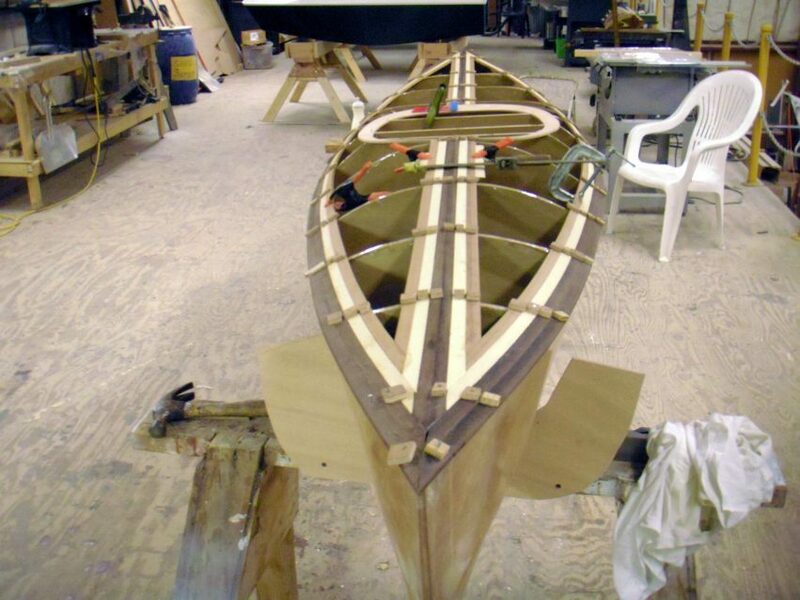 This entry was posted in Boat Construction, Canoe & Kayak Construction, Schools on August 5, 2015 by ewadmin.